Bottled water is a necessity of office life. No matter what the industry, you need a water cooler where people can gather for refreshment and maybe to shoot the breeze for a few minutes before heading back to work. Understandably, many offices go through a lot of bottled water. 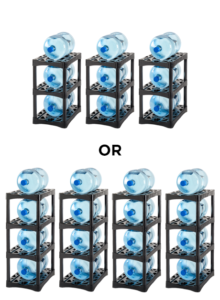 They need a way to easily store the water so it’s convenient to the cooler but doesn’t provide an eyesore in the office. 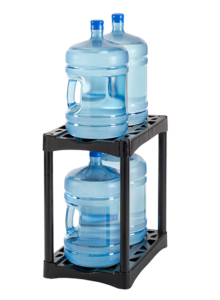 That’s where Bottle-Up®, our bottled water display rack, can help. 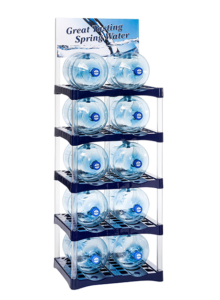 Our racks not only provide a storage solution for your customers’ offices, giving them a place to store their water close to the cooler, but the racks can also protect the bottles. The bottles will be stored off the ground, in a controlled and organized environment, rather than tossed haphazardly wherever there happens to be space available in the cooler room. 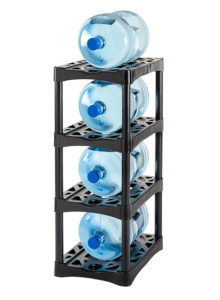 When you offer your customers our plastic bottled water racks, they get a product that’s sturdy and reliable. You can even generate revenue by reselling these display racks to your customers. 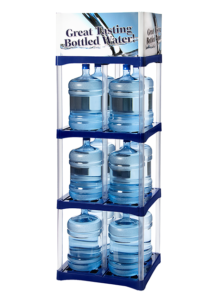 Each Bottle-Up rack is built to store 5-gallon water bottles, the standard for most offices. We construct the racks from injection-molded HDPE. You can easily wipe down our racks, keeping them clean and hygienic. 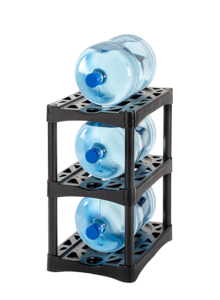 We also offer full-depth trays to protect your bottles and provide greater stability. Additionally, we have drip trays to catch any drips from the jugs, just in case. You can also purchase them in laydown or standup options. These storage options have great flexibility — you can tailor the display to whatever your client needs, improving their satisfaction in the process. Polymer Solutions International, Inc., has been a leader in material handling since our founding in 1997. We provide storage and transportation products that help make your company’s job easier. 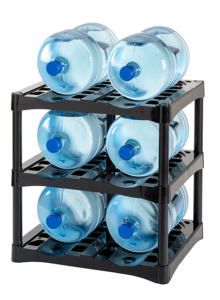 Whether you need to store large water bottles or transport product on a plastic pallet, we have the tools you need to help get the job done. We’ve also made a commitment to sustainability that our customers can appreciate. We believe in making the world greener. When you buy a product from us, we make sure to use as little extra packing material as possible to keep it out of the landfills. The packing material we do employ is reusable, meaning you can save it for use in the future. We make our plastic products from recycled materials as well, and when you no longer need to use one of our products, we can help you recycle or repurpose it.